This promising career was interrupted, by the deaths of his father, mother, grandmother and young son, in a single year. Another distraction was William, who frequently asked him to draw up plans for his inventions, and whom he always indulged with help and money. But, heavily influenced by the works of John Milton, he continued with his grand themes, despite setbacks. 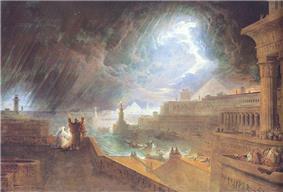 In 1816 Martin finally achieved public acclaim with Joshua Commanding the Sun to Stand Still upon Gibeon, even though it broke many of the conventional rules of composition. 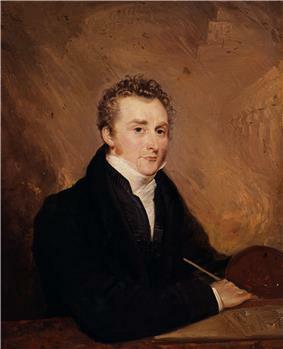 In 1818, on the back of the sale of the Fall of Babylon for £420 (equivalent to £30,000 in 2016), he finally rid himself of debt and bought a house in Marylebone, where he came into contact with artists, writers, scientists and Whig nobility. In private Martin was passionate, a devotee of chess—and, in common with his brothers, swordsmanship and javelin-throwing—and a devout Christian, believing in "Dickens, Faraday and Turner among them. Martin began to experiment with mezzotint technology, and as a result was commissioned to produce 24 engravings for a new edition of Paradise Lost—perhaps the definitive illustrations of Milton’s masterpiece, of which copies now fetch many hundreds of pounds. Politically his sympathies are not clear; some claim he was a radical, but this is not borne out by known facts; although he knew William Godwin, the ageing reformed revolutionist, husband of Mary Wollstonecraft and father of Mary Shelley; and John Hunt, co-founder of The Examiner. Martin's work influenced the Rider Haggard, Jules Verne and H. G. Wells were influenced by his concept of the sublime. The French Romantic movement, in both art and literature, was inspired by him. Much Victorian railway architecture was copied from his motifs, including his friend Brunel’s Clifton Suspension Bridge. A number of Martin's engineering plans for London which included a circular connecting railway, though they failed to be built in his lifetime, came to fruition many years later. This would have pleased him inordinately – he is known to have exclaimed to his son, Leopold, that he would rather have been an engineer than painter. In 2011–12 Tate Britain and Newcastle's Laing Art Gallery co-curated a major retrospective exhibition of Martin's work in all genres -"John Martin – Apocalypse" – including his contribution as a civil engineer. 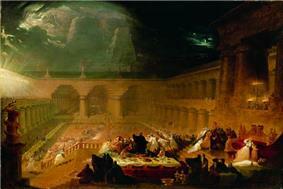 Featured in the exhibition was the fully restored "The Destruction of Pompeii and Herculaneum", 1822. 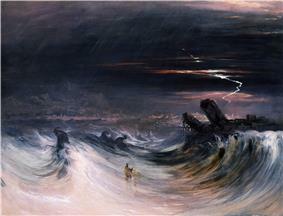 Recorded as lost in the disastrous Tate Gallery flood of 27 January 1928, the painting was rediscovered by Christopher Johnstone, a Research Assistant at the gallery, when he was researching his book "John Martin" (1974). Its restoration by Tate conservator Sarah Maisey, reveals that the original paintwork was in near pristine condition; a large area of missing canvas has been repainted by Maisey using techniques that were not available in 1973 as she describes on page 113 of the exhibition catalogue John Martin: Apocalypse (2011). When rediscovered the painting was rolled up inside the missing Paul Delaroche painting "The Execution of Lady Jane Grey" which was returned to the National Gallery, London. In addition to being a painter, John Martin was a major mezzotint engraver and for significant periods of his life he earned more from his engravings than his paintings. 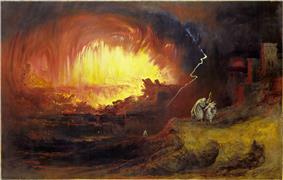 In 1823, Martin was commissioned by Samuel Prowett to illustrate John Milton's Paradise Lost, for which he was paid 2000 guineas. However, before the first 24 engravings were completed he was paid a further 1500 guineas for a second set of 24 engravings on smaller plates. Some of the more notable prints include Pandæmonium and Satan Presiding at the Infernal Council, remarkable for the science fiction element visible in the depicted architecture, and arguably his most dramatic composition Bridge over Chaos. Prowett issued 4 separate editions of the engravings in monthly instalments, the first appearing on 20 March 1825 and the last in 1827. Later, inspired by Prowett’s venture, between 1831 and 1835 Martin published his own illustrations to the Old Testament but the project was a serious drain on his resources and not very profitable. He sold his remaining stock to Charles Tilt who republished them in a folio album in 1838 and in a smaller format in 1839. ^ "End of the world visions Viewspaper 14–15". The Independent (London). 19 September 2011. ^ Reminicences of John Martin, the Newcastle Weekly Chronicle, Supplement, 1889. ^ a b Lambourne, Lionel (1999). Victorian Painting. London: Phaidon Press. p. 160. ^ Mark Brown, arts correspondent (4 March 2011). 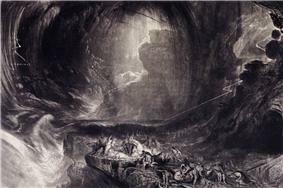 "John Martin makes a dramatic come-back". London: the Guardian. Retrieved 25 April 2013. ^ Wood, Christopher (1999). Victorian Painting. Boston: Little, Brown & Co. p. 19.